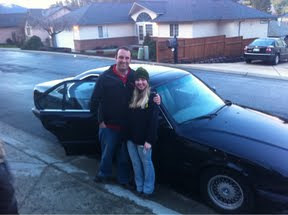 My son and daughter have purchased a car. He took the train to Portland to make this purchase, then drove his new car home. It's very nice. When he got back into town last night, they drove to our house so we could see The Car. We all sat in it, then we went for a drive to the top of the hill. We went fast, and glided around the corners. It was fun. Even though it's not our car, we shared in the excitement with our son and daughter. We want them to be happy. We want them to have good things. Just the way Jesus feels about me. He is excited for me to receive good gifts. He wants me to be happy. Say That Again, Jesus. You want to bless me in Your way, with Your gifts! Congrats on their new car! God is god isn't He! Thanks for your comments on my site to. Your site is very encouraging to me as well!